This week it is Children’s Book Week, which is run by the Children’s Book Council of Australia. Librarians and teachers everywhere will be thinking up exciting new ways to encourage children to read, while the CBC has awarded prizes to the best new Australian children’s books. I thought it would be fun to join in the celebrations, and many of the books chosen are classics and award winners. I know two characters with this name. One is Amaryllis “Ryl” Mereweather, from H.F. Brinsmead’s Pastures of the Blue Crane (1964), about a teenage girl who inherits an old shack in northern New South Wales. (Name nerd bonus info: H.F. Brinsmead stands for Hesba Fay – Hesba is derived from the Greek hesperus, meaning “western”). The other is in Sally Odger’s fantasy Amy Amaryllis (1992), about an ordinary Australian girl named Amy Day who switches identities with a girl named Amaryllis Loveday, from a magical world named Ankoor. Amaryllis is a Greek name meaning “to sparkle”, perhaps to suggest sparkling eyes. In Virgil’s pastoral poems, The Eclogues, Amaryllis is a beautiful shepherdess, and the poet makes a play on words to suggest that her name comes from Latin amor, “love”. The amaryllis flower is often known as “Easter lily” in Australia; it is named after the literary character, so this is not just a simple flower name. Unusual and lovely, Amaryllis comes with a host of possible nicknames, including Amy, Ryl, Rylla, Lily, Lissy, and Mary. In Playing Beatie Bow (1980) by Ruth Park, Beatie Bow is a local legend, a game that children play to frighten each other. But when teenage loner Abigail watches the game, she is brought to the Sydney of one hundred years earlier by a strange girl named Beatrice “Beatie” Bow. This classic is a YA time-travel historical mystery adventure with a dash of romance, and so firmly grounded in The Rocks area of Sydney that you can follow every step of Abigail’s journey. (Name nerd bonus info: Abigail’s parents named her Lynette, but when her parents separate, she chooses Abigail for herself, because it’s an “old witch” name). Beatrice is the Italian form of Beatrix, very famous because of the beautiful muse in Dante’s Divine Comedy. The name has been used in England since the Middle Ages, including by royalty; Princess Beatrice of York was named after a daughter of Queen Victoria, but itwas used in the royal family long before. It’s also a Shakespearean name, because in the comedy Much Ado About Nothing, Beatrice is the witty heroine. Beatrice was #50 in the 1900s, and left the Top 100 in the 1930s; by the 1960s it had left the charts. It made a modest comeback in the 1990s, after the birth of Princess Beatrice, and has remained around the 500-600 level. This is an elegant retro name which has long remained underused. Bea is the usual nickname, although Beatrice Prior from the Divergent series goes by Tris. Little Ragged Blossom is one of the main characters in May Gibbs‘ Snugglepot and Cuddlepie series (1918-40), featuring her plump “gum nut babies”. Blossom is a poor little gum-blossom girl, alone in the world until she gains the friendship and protection of gum-nut boys Snugglepot and Cuddlepie. From then on, she is part and parcel of their adventures, and not infrequently plays the role of damsel in distress, such as when she needs rescuing from the wicked Banskia Men. Even now, I cannot see a gum tree in bloom without imagining the flowers as little blossom girls … The word blossom is used for flowers that grow in masses and clusters, especially on trees, and evokes spring and freshness. Blossom has been used as a girl’s name since the 18th century, and is probably more common as a nickname, such as aviation engineer Maxine “Blossom” Miles, or a middle name, such as jazz singer (Margrethe) Blossom Dearie. On television, Blossom was one of the Powerpuff Girls, and Blossom Rosso the floppy-hatted heroine of sitcom Blossom. Ultra-feminine, quirky and cool, could Blossom be the ultimate flower name? Feeling Sorry for Celia (2000) is Jaclyn Moriarty’s side-splittingly comic début epistolary YA novel. Private school girl Elizabeth spends most of her time fretting over her best friend Celia, whose life is one self-caused drama after another. However, a pen-pal programme with the local public school teaches Elizabeth how real friendship works. Celia is the feminine form of Caelius, a Roman family name traditionally derived from caelum, Latin for “heaven”. However, the Caelii traced their ancestry to the Etruscan hero Caeles Vibenna, so the name probably isn’t Latin in origin. It may come from Cel, the Etruscan earth goddess who is the equivalent of Gaia; her name means “honoured”, and the Etruscans named the month of Celi (September) after her. I like the idea of an earthy goddess becoming connected with heaven. Shakespeare used the name for an attractive, serious character in As You Like It, and Ben Jonson wrote the poem Song to Celia, which became Drink To Me Only With Thine Eyes. These writers sparked interest in Celia as an English name in the 17th century. This literary name is both rare and traditional, and doesn’t seem out of place next to popular names like Olivia and Sienna. Ethel C. Pedley’s posthumous novel Dot and the Kangaroo (1899) is about a five-year-old girl named Dot who wanders off into the bush and gets lost. She is befriended by a kangaroo who has lost her joey, and gives Dot some magic berries that allow her to understand the speech of animals. It has a strong conservationist message in regard to our native flora and fauna, which is still very much needed. The book was the first to show Australian animals in a genuine Australian setting, and became an immediate favourite. Dot is a short form of Dorothy which dates to medieval times, and has been used as an independent name at least since the 17th century. This adorably pert little name could honour a Dorothy, and also works well in the middle. Ethel Turner’s Seven Little Australians (1894) is the only Australian book to be continuously in print for more than a century. Featuring a family of mischievous, lovable army brats who live in Sydney’s outer suburbs, it is surprising how little it has dated. Blended families, teen rebellion, obsession with body image, schoolgirl crushes, and discipline problems … all topics of interest more than a hundred years ago too. The seven little Australians are Meg, Pip, Judy, Nell, Bunty, Baby, and The General; their father is stern Captain Woolcot and stepmother (The General’s mother) is Esther. Esther is beautiful and sweet, but barely older than her eldest step-children, and incapable of really mothering them. Hilarious, heart-warming, and tragic, this is one of Australia’s best-loved children’s books. In the Bible, Esther was a Jewish queen of a Persian king; her story is the basis for the Jewish holiday of Purim. The meaning of Esther is much debated. It may be from a Semitic word meaning “star, morning star”, or a Median word meaning “myrtle” (the translation of her Hebrew name, Hadassah). Another theory is that it comes from the Babylonian fertility goddess Ishtar (Ishtar also represents the morning star, Venus). Esther was #73 in the 1900s, and left the charts in the 1920s. It reached its lowest point in the 1950s and ’60s at #379, but has climbed since then, and isn’t far outside the Top 100 in Victoria. This underused classic is very much on trend at present. 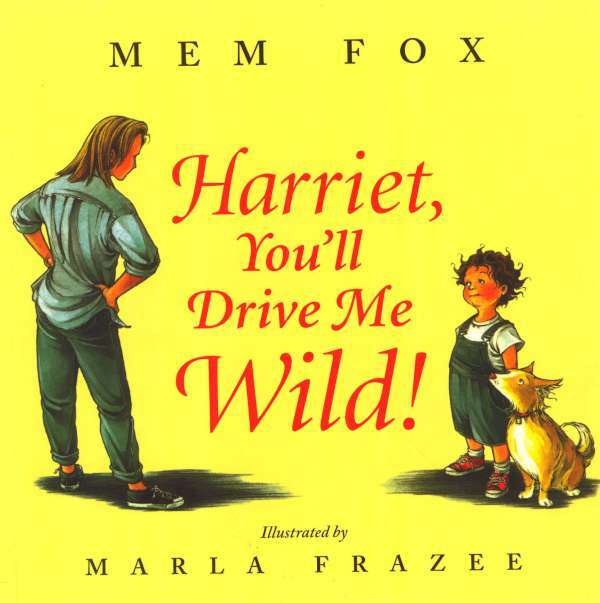 Harriet, You’ll Drive Me Wild (2000) is a picture book written by kidlit doyenne Mem Fox, illustrated by Marla Frazee. Harriet Harris is a toddler who doesn’t mean to be naughty, but trouble follows in her wake without her even trying. Harriet’s mother is a calm woman who doesn’t like to yell, but Harriet pushes her to breaking point. The book helps explain to littlies why parents lose their cool. (Name nerd bonus info: Mem Fox’s full name is Merrion, but she has always gone by Mem). Harriet is the English form of Henriette, the feminine form of French Henri, and thus a feminine form of Harry. Harriet was #122 in the 1900s, and left the charts in the 1930s. It returned in the 1970s, and has been climbing ever since. Last year it was one of the fastest rising names of 2013, and joined the Top 100 at #89. Cute and spunky, it can be shortened to Hallie or Hattie – Hattie is a hen in Mem Fox’s Hattie and the Fox (1986). Josephine Alibrandi, known as Josie to her friends, features in Melina Marchetta’s breakthrough YA novel, Looking for Alibrandi (1992). A coming of age story, its smart-mouth heroine is in her last year of school, dealing with boys, family, exams, mean girls, and her father, who left when she was a baby and has suddenly reappeared in her life. Looking for Alibrandi was an instant success upon publication, and has been called “the most stolen library book”. Josie is a short form of Josephine, used as an independent name since the 16th century. It has sometimes been given to boys, as a short form of Joseph or Josiah. Josie first ranked in the 1920s at #291, and left the charts in the 1940s. It returned in the 1970s, and climbed before peaking in 2009 at #175. This is an underused retro name which doesn’t sound old-fashioned, but sassy and stylish. Liesel Meminger is the young girl in Markus Zusak’s The Book Thief (2005), set in Nazi Germany during World War II, and narrated by Death himself. Liesel is illiterate at the start of the story, but through learning to read, discovers a lifelong love of words, and finds solace in stealing books to share with others. Against a backdrop of fear and horror, the story shows that books can feed the soul even in our darkest hours. The story does end up having an Australian connection, and a specific Australian setting is used in a very unexpected way. Liesel is a German pet form of Elisabeth, pronounced LEE-zel. Although it’s never charted in Australia, this charming name is very familiar because of Liesl from The Sound of Music, and swimmer Leisel Jones. Norah Linton is the heroine of Mary Grant Bruce’s Billabong series (1910-42). Making her début in A Little Bush Maid at the age of twelve, Norah lives at Billabong Station in northern Victoria. She’s a hardy, spirited tomboy who loves horse-riding, camping, and fishing, and is a total daddy’s girl. The books haven’t aged too well, but Norah is an ancestor of other feisty, independent Australian heroines, such as Ryl Merewether and Josie Alibrandi. Norah is a variant of Nora, a pet form of names such as Honoria and Eleanor. It’s often thought of as particularly Irish, and records show many Norahs of the 18th century were born in Ireland. Hip and arty, Norah is fast growing in popularity in both the UK and US, and already popular in Europe, but almost unknown in Australia. It deserves serious consideration by those keen to get ahead of the trends. Thank you to Manday for suggesting the name Liesel be featured on Waltzing More Than Matilda, and for recommending The Book Thief be added to this list. The public’s favourite names were Beatrice, Harriet and Norah, and their least favourite were Josie, Blossom and Dot. I love so many of these books! !